An excerpt from the new eBook Vonnegut by the Dozen: Twelve Pieces by Kurt Vonnegut. 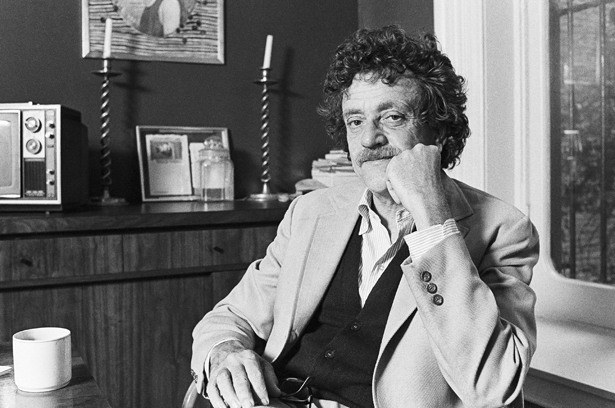 This is an excerpt from the new ebook Vonnegut by the Dozen: Twelve Pieces by Kurt Vonnegut, a collection of essays and articles published in The Nation. The eBook is now available on tablets, smartphones and computers—download yours today. What has been America’s most nurturing contribution to the culture of this planet so far? Many would say Jazz. I, who love jazz, will say this instead: Alcoholics Anonymous. I am not an alcoholic. If I was, I would go before the nearest A.A. meeting and say, “My name is Kurt Vonnegut. I am an alcoholic.” God willing, that might be my first step down the long, hard road back to sobriety. Not every member of A.A. or G.A. has sunk quite that low, of course–but plenty have. Many, If not most, have done what they call “hitting bottom” before admitting what it is that has been ruining their lives. For an alcoholic to experience a little joy, he needs maybe three ounces of grain alcohol. Alcoholics, when they are close to hitting bottom, customarily can’t hold much alcohol. If Western Civilization were a person, we would be directing it to the nearest meeting of War-Preparers Anonymous. We would be telling it to stand up before the meeting and say, “My name is Western Civilization. I am a compulsive war- preparer. I have lost everything I ever cared about. I should have come here long ago. I first hit bottom in World War I.” Western Civilization cannot be represented by a single person, of course, but a single explanation for the catastrophic course it has followed during this bloody century is possible. We the people, because of our ignorance of the disease, have again and again entrusted power to people we did not know were sickies. And then what? Western Civilization’s long, hard trip back to sobriety might begin. Not every child gets hooked. Not every child so tempted grows up to be a drunk or a gambler or a babbler about knocking down the incoming missiles of the Evil Empire with laser beams. When I identify the war-preparers as addicts, I am not calling for the exclusion of children from all martial celebrations. I doubt that more than one child In a hundred, having seen fireworks, for example, will become an adult who wants us to stop squandering our substance on education and health and social justice and the arts and food and shelter and clothing for the needy, and so on–who wants us to blow it all on ammunition instead. Should addicts of any sort hold high office In this or any other country? Absolutely not, for their first priority will always be to satisfy their addiction, no matter how terrible the consequences may be–even to themselves. So he has all the liquor thrown out of the White House, including his Aqua-Velva shaving lotion. So late at night he is terribly restless, crazy for a drink but proud of not drinking. So he opens the White House refrigerator, looking for a Tab or a Diet Pepsi, he tells himself. And there, half-hidden by a family-size jar of French’s mustard, is an unopened can of Coors beer.